The Ann Stookey Fund for New Music supports a second consortium commission for Notre Dame Vocale with The Crossing (Philadelphia), I Cantori New York (New York City) and Volti (San Francisco) for a new work by Pulitzer Prize winner Caroline Shaw. Notre Dame Vocale, the choral research project of Professor of Conducting Carmen-Helena Téllez at the University of Notre Dame has joined the Grammy-winning conductor and ensemble Donald Nally and The Crossing to commission a new work by Pulitzer Prize winner Caroline Shaw. They are also joined by Mark Shapiro and I Cantori New York, and Robert Geary and Volti of San Francisco. 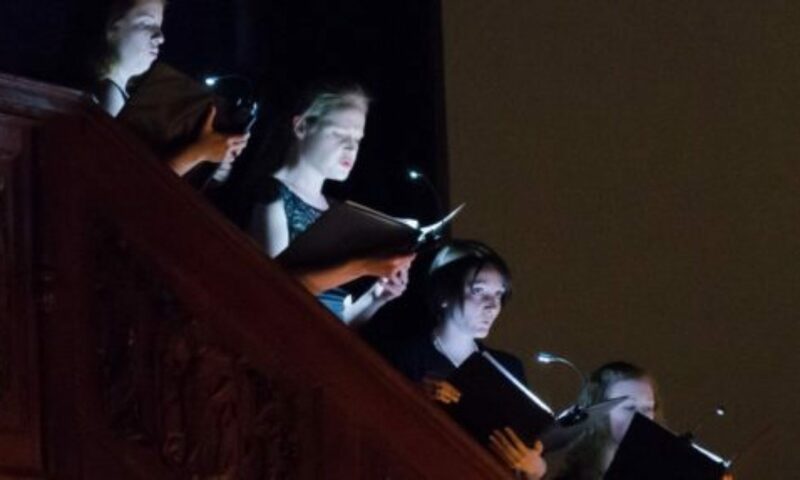 The project is supported by the Ann Stookey Fund for New Music, who also supported the commission of Robert Kyr’s Paradiso, premiered by Notre Dame Vocale at Notre Dame during the sacred music drama “Journeying La Divina Commedia: Desert, Discovery, Song” in 2016. The Ann Stookey Fund also supported the first commission of the consortium, a work on Catholic poets by American composer Gregory Spears, The Tower and the Garden. Notre Dame Vocale is proud to represent the work of university ensembles in a consortium that includes some of the best professional ensembles in the United States. Composer, violinist, and singer Caroline Shaw is the youngest recipient of the Pulitzer Prize in Music. She appears regularly as a vocalist with Roomful of Teeth and as a violinist with the American Contemporary Music Ensemble. Her works have been performed by The Crossing, the Baltimore Symphony, Roomful of Teeth, So Percussion, the Brentano String Quartet, and many other leading ensembles. She has also co-produced and contributed vocals to several Kanye West tracks. She visited Notre Dame last Fall with A Roomful of Teeth, and she composed a new work, In Living Green, for the Notre Dame Children’s Choir in 2017. Donald Nally and The Crossing will perform at Notre Dame this Sunday, February 10, at the DeBartolo Performing Arts Center. Notre Dame Vocale also will give the Indiana premiere of Spears’ TheTower and The Garden on May 10, 2019, in an interdisciplinary concert that will also include The Beatitudes, a new choral work by Professor Jorge Muñiz of Indiana University South Bend, in collaboration with the Notre Dame Children’s Choir and the Euclid Quartet. For more information on the work of the Ann Stookey Fund, please visit at http://annstookeyfund.org/our-work/. You can also follow the Fund on Facebook (Ann Stookey Fund for New Music) or Twitter (@AnnStookeyMusic). Notre Dame Vocale’s CD of Paradiso was released last December 1st by Albany Records. Next PostNext Philip Glass’ “A Madrigal Opera” – our contribution to a celebration! Philip Glass’ “A Madrigal Opera” – our contribution to a celebration!